Sky Sports have ranked all English Football Clubs based on their league performance over the course of the last 50 seasons. The criteria they have used is that to be included, clubs have to have been in the top four divisions for at least 10 season in these last five decades worth of football. At the very top you have Liverpool, which is little surprise. Yes, they might not have won the title in the Premier League era but very rare that they aren’t in the top handful of clubs. They have a remarkable average league placing of 3.5 in these last 50 seasons. If asked the question, I doubt many football supporters would guess that Manchester United don’t even finish second in this table. The superb consistency Arsene Wenger produced at Arsenal sees them runners-up, with an average league position of 4.9. Well, on the basis of relative success over these last 50 years, who are the top clubs? 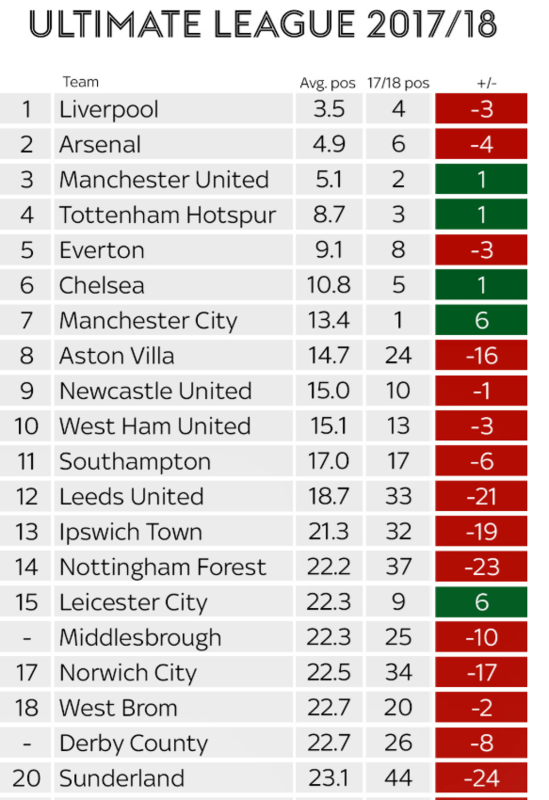 Alongside many of the usual suspects, Newcastle United are the 9th most successful of English Football Clubs over this period. The Magpies having an average position of 15.0 during this period. So who would make a Premier League’s worth of top clubs over the last 50 years, which 20 clubs? Well just scraping in at 20th, below the likes of Middlesbrough, Norwich, Ipswich, Derby and West Brom, you have Sunderland. They finished 44th this season just gone and now have an average league placing of 23.1. Interesting to see that there are as many as eight of these clubs in the top 20 of the last 50 years, who weren’t in the Premier League in the 2017/18 season.